The 2013 All-Star Weekend in Houston, Texas is upon us! It has been an exciting and entertaining 50+ games of the season so far and what a great way to have a short break from regular season basketball by watching exhibition basketball at its finest! But before heading to the break, there's the matter of examining the exceptional play of the Miami Heat and San Antonio Spurs while criticizing the lackluster play of the Los Angeles Lakers and Golden State Warriors in the last week. LeBron James has started to slightly separate himself from Kevin Durant from the MVP race with another win by the Heat over the Thunder, their 6th straight win in this series. The Heat 3 have been hot in their 7-game winning streak which gives the Heat the longest streak in the NBA. The Warriors, Blazers and Nuggets are mired in losing streaks in the competitive Western Conference while the Knicks and Sixers have stumbled with 2-game losing streaks heading into the break. The standings are current up to February 15, 2013. The rankings from last week refer to Week 14. 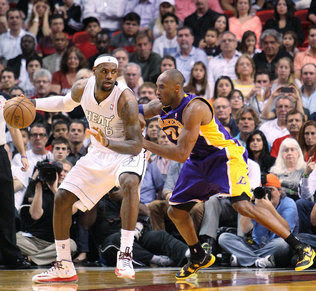 LeBron James powered the Heat over the Lakers last Sunday. Did the Heat top the Power Rankings? LeBron James had a streak of 6 games with 30+ points and at least 60% shooting. The Heat have won 7 straight, their longest of the season. They defeated the Rockets, Clippers, Lakers and Thunder during that stretch. They are the only team with 3 players going to the All-star game, all starters too. The Spurs have won 14 of 15 with Tim Duncan and Ginobili missing games in between. They even won a game without Parker when they beat the Bulls in Chicago by 14 points. They are 4-1 in their current Rodeo Road Trip with another 4 games after the break. The Thunder has lost 2 straight but more importantly, they have lost 6 straight to the Heat dating to last year. Kevin Durant had a nasty fall in their last game but still played 47.5 minutes and scored 40 points. KD is still in contention with LBJ for MVP but the Thunder need the best record for that. The Clippers have everybody back and healthy. They have won 4 straight and are currently 3-0 vs the Lakers. Their bench is the deepest in the league. Grant Hill has not had the chance to play much lately. Chauncey Billups has been great in his last 2 games: 20 ppg & 68% shooting in just 18 minutes. The Knicks have struggled playing at home. They have lost 2 straight, both at home including against the Raptors. Their once 10-0 home record is now at 19-8. The Knicks are now 4 games behind the Heat for top seed in the East and talks of Melo being MVP have faded. The Grizzlies are 4-2 since the Rudy Gay trade. Tayshaun Prince has been a solid contibutor playing 32 minutes and getting 10 points, 3 boards and 3 assists. Ed Davis got the short end of the stick since he aint playing much in Memphis. Davis was getting 10 and 7 in Toronto. The Nuggets encountered injuries to Iguodala and Gallinari in their last 3 games on the road and they lost all 3 after winning 9 straight. Ty Lawson has picked up the scoring without the others, averaging 28 points and 9 assists. If Lawson continues to be aggressive when the others come back, the Nuggets can win 9 straight again. Danny Granger is close to coming back. He could be back after the All-star break. It will be interesting to see how the Pacers can integrate their former star back into the lineup since Paul George is now their best player and David West is their 2nd best player. The Nets lost Deron Williams to injury for 2 games and they responded by winning those 2 games vs the Pacers and Nuggets. Joe Johnson and Brook Lopez took turns in providing the offense while Reggie Evans grabbed 22 boards vs the Pacers. The Bulls only gave up 71 points to the Celtics but lost since they scored just 69 points. They also lost to the Spurs by 14 points who played without Duncan and Parker. There's talk that Derrick Rose is willing to miss an entire season to make sure he has fully recovered. Yikes. The Warriors have lost 5 straight and 3 of those have been in blow outs. Andrew Bogut blasted his team for playing poor defense. Jarrett Jack missed 3 games during that losing streak and the Warriors clearly needed his veteran leadership and court awareness. The Jazz is in 7th spot in the West with 4.5 games separating them from the 9th spot. The Jazz played great in defeating the Thunder by 15 points at home. Gordon Hayward has missed the last 10 games with a shoulder injury. He is expected to be back after the break. The Celtics continue to win without Rondo and they have won 8 of 9. The injury bug also caught Leandro Barbosa who tore his ACL and is out for the season. Jeff Green, Brandon Bass and Jason Terry are starting to score more consistently with the regular minutes they are getting. The Rockets lost a crucial game to the Clippers without Harden who had a sprained ankle. The Rockets have a 3-game lead over the 9th spot in the West. Their next 2 games are vs the Thunder and Nets. Who would have thought that Chandler Parsons is their 2nd best player? The Hawks have won 3 of 4 and Josh Smith has produced monster numbers in his last 5 games: 21 points, 10 rebounds and 5 assists plus 3 double-doubles. Trade rumors continue to hound Smith and his excellent play of late might just get him more suitors, thus get traded finally. The Bucks are 8th in the East and have a 4-game lead over the Sixers. Brandon Jennings denied rumors that he asked to be traded. Larry Sanders continues to miss games due to a back injury and his return is uncertain. Dalembert has played good lately (16 ppg, 11 boards). The Lakers have won 8 of 12 but they still trail the 8th spot by 3.5 games. Dwight Howard has been a major disappointment and if the Lakers miss the playoffs, Howard will definitely be gone in the summer. It seems that Kobe and Dwight dont get along well on and off the court. The Blazers have lost 5 straight and finished 1-5 in their 6-game road trip. The low point of that trip was the last game where they only scored 63 points vs the Hornets. They lost games to teams they should beat (Magic, Mavs, Hornets) if the 8th spot is their goal. Dirk Nowitzki has scored over 20 points once in 23 games and has no 10 rebound games so far. The Mavs are very unlikely to make the playoffs as they need to overtake 3 teams for the 8th spot. Will the Mavs be sellers or buyers at the trade deadline? The Sixers did not gain any ground on the 8th spot with their latest loss to the Bucks. More bad news: Andrew Bynum is not expected to be back at the end of February. His return is uncertain again. Thad Young will miss another 10 days from his thigh injury. The Raptors have won 4 straight and Rudy Gay has 2 game-winning shots in the 7 games he has played with the Raps. Gay also leads them in scoring and the Raptors are trying to unload Andrea Bargnani. Alan Anderson has been great off the bench in his last 3 games (16 ppg). Andre Drummond has a back injury that forces him to miss 4-6 weeks. He could have given Lillard competition for the ROY award before he got hurt. The Pistons are 3-3 with Jose Calderon and he has been steady with 15 points and 7 assists while Brandon Knight has struggled. Derrick Williams and Ricky Rubio (15 and 9 in his last 5 plus double figure assists in 4 straight games) have started to play better and Nic Pekovic has been a beast (4 double-doubles in his last 5) but the Timberwolves just dont have enough healthy bodies and firepower to beat quality teams. The Hornets have won 3 of their last 4 due to the magnificent play of Grievis Vasquez who notched his first career triple-double in a win vs the Hawks. Ryan Anderson (17 points, 6 boards) has also been great off the bench and he is a viable candidate for 6th Man of the year. DeMarcus Cousins is the best offensive center in the game today. His mouth and antics can be offensive to his coach and his team, plus the officials as well. DMC leads the league in technical fouls at 12 and also leads the NBA in ejections at 3. The Wizards have won 4 of 5 and are looking like a borderline playoff team. It's too bad John Wall missed more than 2 months which assured the Wizards of missing the playoffs again. Bradley Beal erupted for a career-high 28 points vs the Bucks. The rookie and Wall will be a delight to watch next season. The Suns have lost 4 straight including 2 against the Thunder by a combined 59 points. Beasley is a natural scorer but very inconsistent. He scored 25 in one game then followed that up with just 4 points. The Suns could not even beat the Lakers with Kobe scoring only 4 pts and had 8 turnovers. Kyrie Irving is doing all he can to propel the Cavs (25, 5 rebs, 6 assists) to wins but his team does not have enough weapons to overcome quality teams often. The Cavs are headed to the lottery again this year and they should trade Varejao in the off-season. The Magic snapped their 12-game losing streak with a win vs the Blazers. Glen Davis is out for the season while Nelson and Redick have missed games to various ailments. Nic Vucevic continues to dominate down low with 4 double-doubles in his last 5 games (17 pts & 14 rebounds). Byron Mullens had a monster game of 25 points and 18 rebounds vs the tired Celtics. That propelled the Bobcats to their 2nd win at home in 17 games (7-19 at home). Their 12th win also assured them not finishing with the worst record in NBA history.